In this tutorial, I will be explaining the thought process behind the drawing and also how and why the drawing came to be. 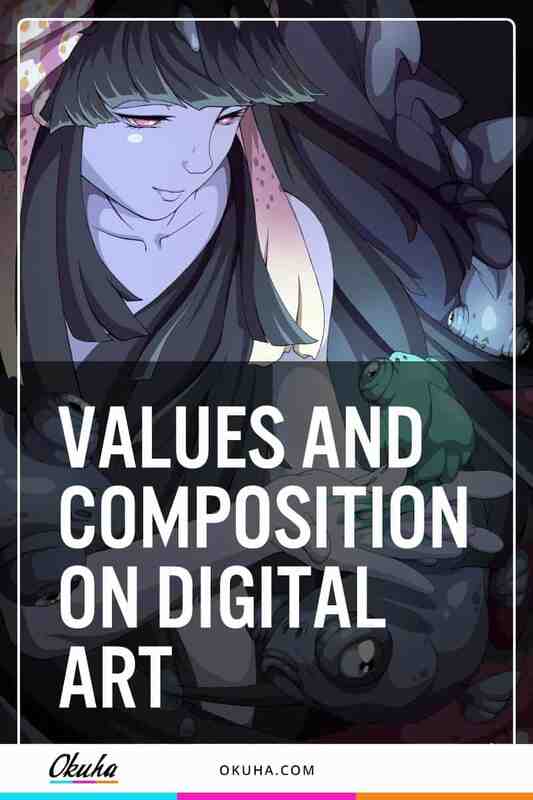 This tutorial is concentrated on the Values and Composition, looking in-depth on the areas and explaining it easily and in an easy to understand form. Trying to show you how you can also apply these to your drawings. So why and how did this drawing came to be? 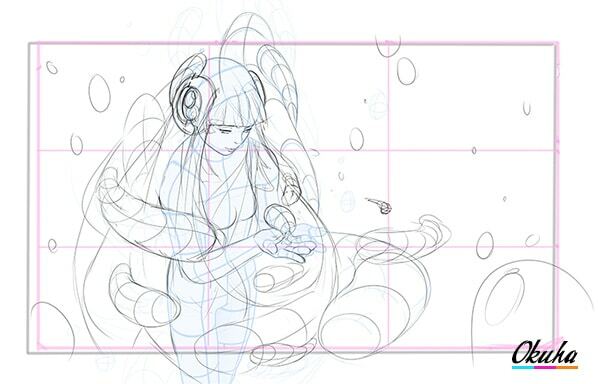 Clip Studio Paint arranged a contest on their facebook page on December 2017. As a fan of the product, I had to enter the contest. The theme was Akari (Light). Around the same time, I was just starting a new drawing and decided to combine the two thoughts. Create a new drawing and enter the contest. 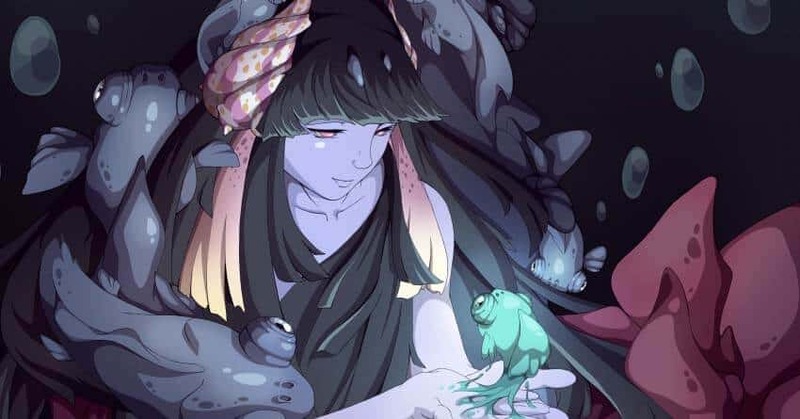 I was hugely inspired by Lois van Baarle’s work and initially thought of creating a character with profile view and holding something in her hands that generate light. However, when I went further with the drawing I noticed that I could make it so much more interesting and decided to ditch the profile view and changed the perspective to “top to bottom” view. If there is even such “view”. I also wanted the character to look at the light source and also be affected by it. Mesmerized. The light source in the center was put there to generate lighting to objects around. “Make it the center of attention.” Perhaps there is something with the fishes that just makes drawing them a joy. Truly don’t know why, but I wanted to make them part of the drawing. 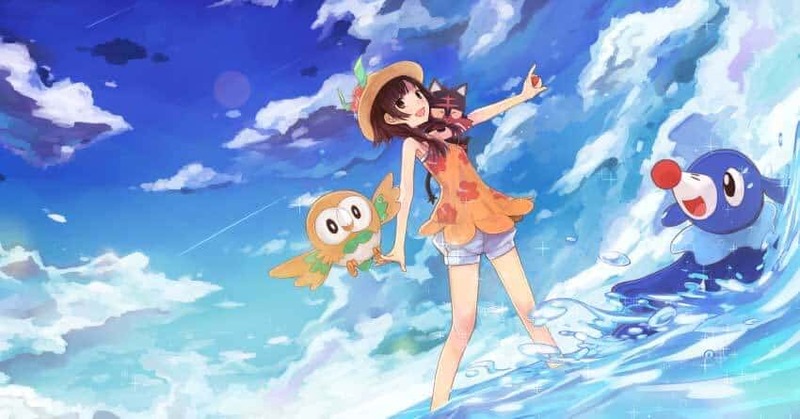 I also wanted to distort the character so that it is unclear whether the fishes are part of the character, passing by the character or something else. As can be seen from the hair, the fishes come and go through the hair, or are they from the hair? I guess I will leave that to you to decide. Initially, I thought of making the fishes bright yellow and the center fish to be blue. However, that changed during the process. In the end, I am glad I went with something new regarding the color palette and composition. Hopefully, this tutorial gives you new ideas and skills to advance in your drawings. As always have fun with your drawing and experiment with the values, colors, and composition until you are satisfied. Value is defined as how light or dark an object or area is. Colors hue or saturation is not affecting the value in any way, as values can be showcased in greyscale and greyscale does not have saturation (brilliance and intensity of a color ) or hue (dimension of color). The Internet is full of knowledge and many have already defined and told what value is. So many times, that it is slightly futile to tell the same, yet again. It could be that this is your first post ever, you are reading. So in that way, it could be useful. I doubt. However, my mission here is to tell you only the things you truly need to know. Nothing extra just the information we truly need. The value, in short, is how light or dark something is no color chosen. That’s it. However how we implement that to the drawing is another thing, so let’s move on. The composition is what keeps the viewer’s eye’s last with the illustration. Good composition guides the viewer’s eyes towards points of interest. Composition rules I used were the Golden Ratio and Rules of Thirds. Yet again, I won’t explain the background of the rules and how they came to be. That information can easily be found through the internet. I will, however, explain how you can place them in your drawings. Using golden ratio you can concentrate drawings main elements to certain spots and guide the viewer’s eyes to the key points. I have placed the fish and the “sea goddess” eye-line (where she watches) with the help of the golden ratio. I have also placed bubbles and other things to the lines where the golden ratio lines are present. 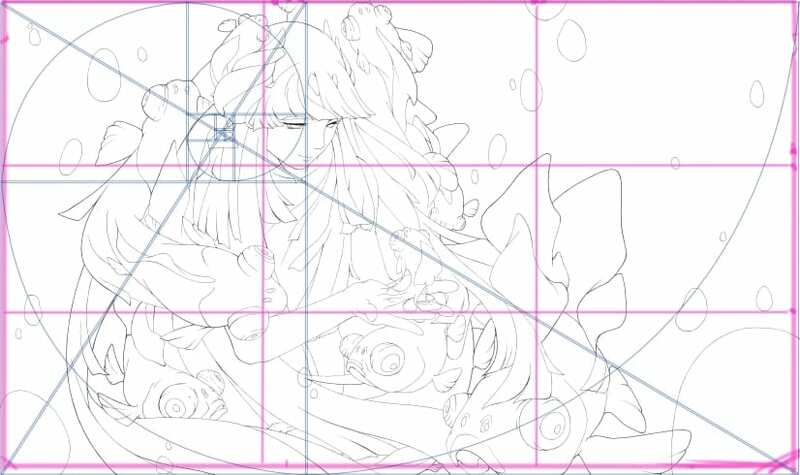 By dividing composition into thirds, vertically and horizontally, and placing key elements of your drawing either on top of these lines or at the junctions of them, you get a drawing that is pleasing to watch. That’s the idea behind it. I am trying to find the right reference images and idea for my next drawing. Clip Studio Paint just announced a “Light/Akari” contest and I thought that why not draw something for the contest. 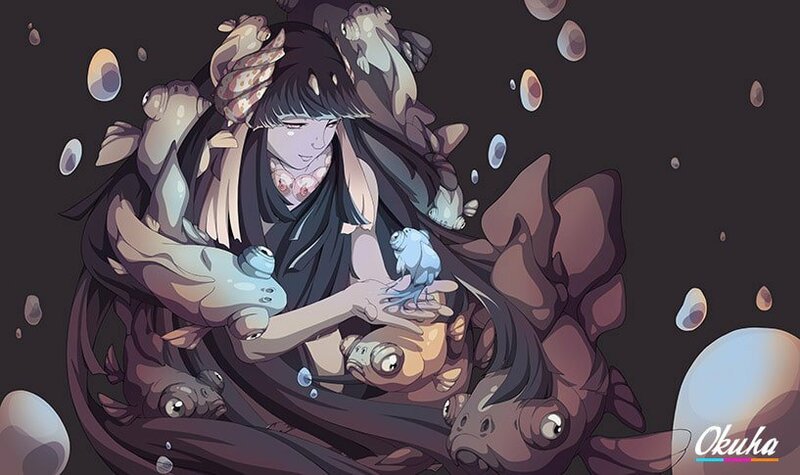 Immediately when I read about the contest I just thought of fishes and a girl surrounded by them. 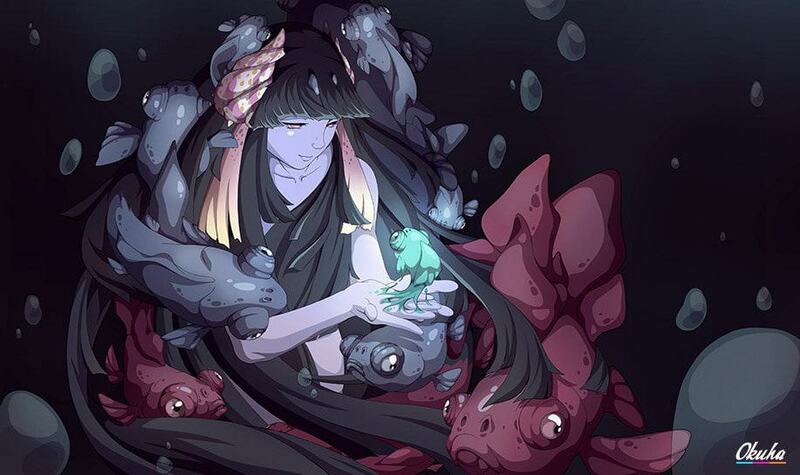 The fishes would be the light source and the girl would be “giving birth” to a new life form or a fish. I am not sure yet what to draw but hopefully, I will come up with something exciting. I have also thought of using blue light for the new life form and the fishes would be bright yellow/red. The whole image would be rather dark but the fishes would light up the scene. We’ll see how it goes. These were the things I thought when I was just starting out. Initially, I thought of doing a profile drawing but it just wasn’t interesting enough. Or at least not in this case. It would have been too empty and kind of dull. Clip Studio Paint (CSP) has this neat 3D modeling feature. Of course, that feature is not fully customizable or deep as some modeling programs offer. Thinking of Daz3D program here. Haven’t tried yet but I should. Seems promising. However, you have the Manga Perspective option in CSP which gives you automatically this dynamic depth which might sometime come handy when you are looking for that added extra depth to the drawings. I didn’t use it this time but the feature is neat anyway. 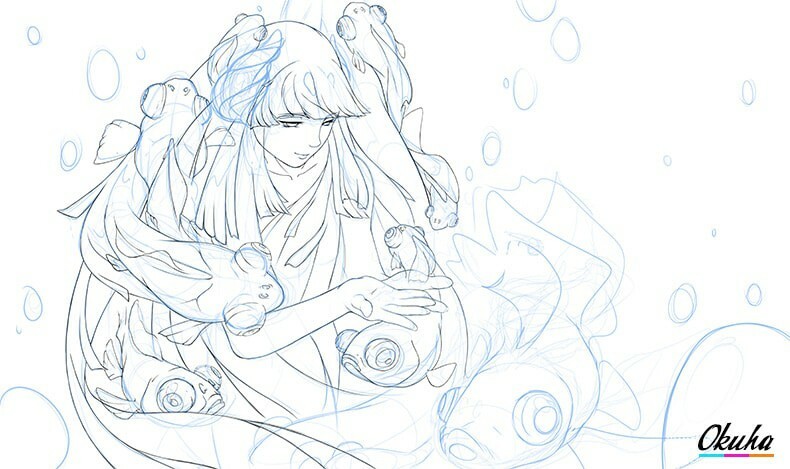 When I have the correct posture and perspective I start adding elements, hair, fishes etc. When I first started the drawing I thought of making it in portrait dimensions (longer than wider) but after experimenting I found that landscape worked better. I also created this frame for the drawing and by moving the frame I was able to find the perfect placement of the character and the elements around it. I placed rules of thirds guidelines and also imported golden ratio image to the drawing. 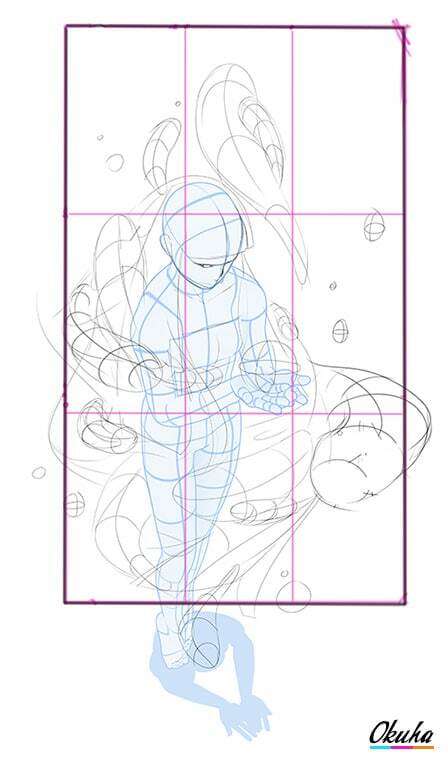 By changing the frame slightly I was able to find excellent positions for different elements in the drawing. The main idea behind the image was creating a focal point to the center while also taking care of other elements supporting that. 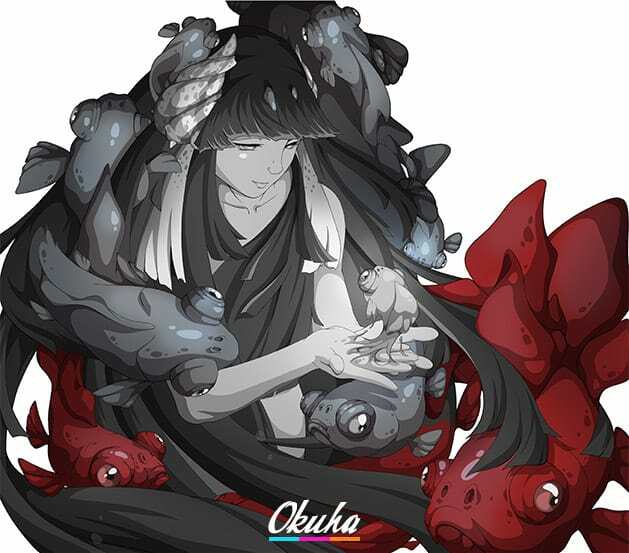 Fishes were made to look at the direction of interest and coming towards the point of interest which is the center fish created by the “sea goddess”. It is important to place elements to correct positions so that the image becomes easy to read and also easy for the eyes to rest on. Place object to conjunctions, to the main areas and also remember to focus on the supporting objects to enhance the main point of interest. Main shapes and idea in place, I started to sharpen the image by drawing details here and there. First on my list was the face of course because that is the first thing the viewer looks for. Next, the eyes to see what is going on. I also tried to place elements to correct places using the rule of thirds as a guide. I used all the Rough Pencil’s: Rough pencil Okuha Dark II, Rough pencil Okuha Dark, Rough pencil Okuha Refine Sketch. I’m using them to get different feel and strokes to the canvas. Changing brushes give you different results and make the image more lively and this way also freeing you to sketch more openly. This stage is all about enhancing the image in every possible way. I do suggest that you still keep your mind free to new ideas and add them to the drawing if it enhances the image and subject. In the refining stage, I usually try different line weights and ideas. Also when the image is slightly more refined you get to see which things work and which not. In this stage, you also decide which lines you keep and what not. Do also take into consideration the composition and the rules you have applied to your drawing. Make sure interesting things happen in the right place. If not, try if you can push the elements towards those sweet spots mentioned before. Drawing itself does not have too many elements even though there is a lot of going on. 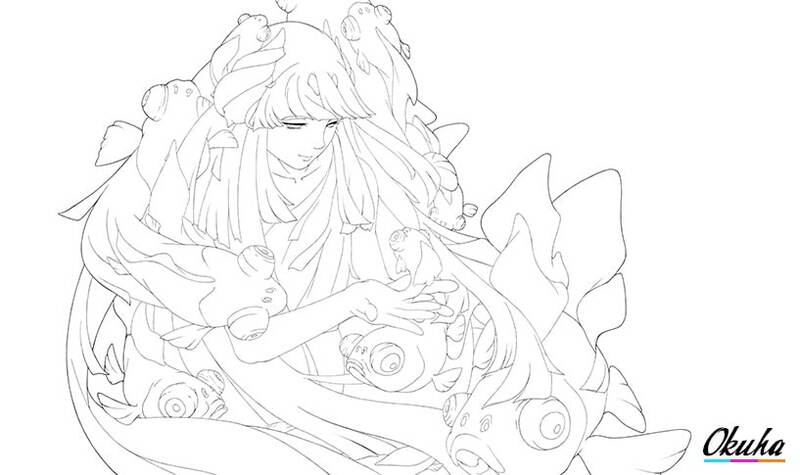 In this stage, I block out the different elements, hair, eyes, skin, fishes, iris etc. However, I am used to nailing down the colors afterward so I more than often create a light colored layer on top of all the colored objects. Coloring can be done later and in cel shade style that is usually nicer to choose colors when you have the shadows in place. The volume of the object comes forward better and you can still correct mistakes easier when you haven’t gone too far with the coloring. So you might even choose to skip the object coloring altogether and just start the rendering process. Coloring and rendering are done with the always handy G-pen Okuha Coloring brush. I know the surrounding is water and thus cool shadows should be in place. 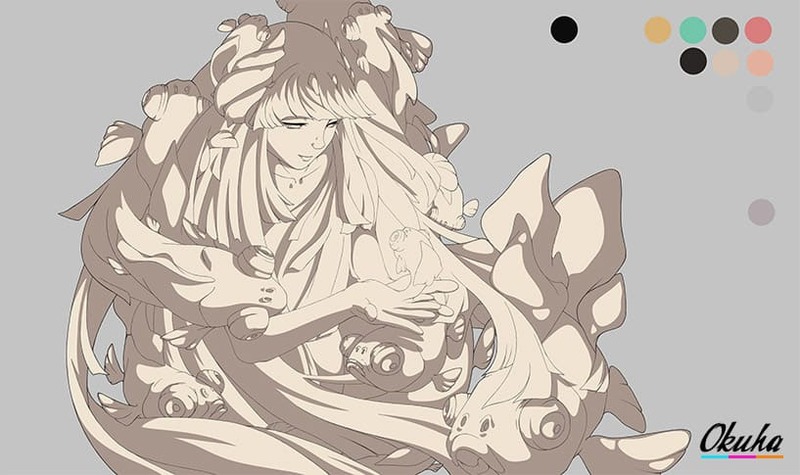 I chose b2a8aa for the color and start rendering. When I am rendering I take into account the light source and this time it is the center fish. The fish radiates light to its surrounding and so I place shadows according to that information. 9e9599 is used for the second shadow and it also is picked from the cold color spectrum. I use light base color in the rendering process so I can concentrate only on the volume, shapes of the objects and shapes of the shadows. I regularly use multiply layer mode for the shadows so that when you change the colors beneath the shadow layers you instantly see the results in a proper way. Could very well be the best stage of the drawing process. When I have the rendering in a good state (mostly done), I deactivate the light color layer and start trying different color schemes for the drawing. Always lock the base color layer for the object so that you can’t draw over the edges. 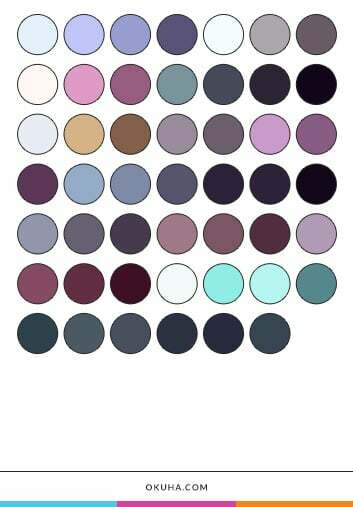 I have configured ‘Fill’ shortcut so that I can just choose colors from the Color Wheel and press F and it automatically fills the layer. That way I can super fast change the colors in the different objects to see how the shadows work in the image. This stage is just fun. You can experiment easily and don’t have to worry about locking any specific color scheme right away. When you have found the correct color scheme you can move on. Although you can still come back to this stage and fix the colors as much as you want. What is important at this stage is that you check the colors values. You can easily do this by creating a black or white layer on top of every other layer and changing that to Color layer mode. If the objects don’t seem to differentiate from one another, you should change the value of the object. Change the value so that it is clearly visible and doesn’t mix with the other objects. I changed the coloring of the few fishes and also placed a value decreasing layer to them. 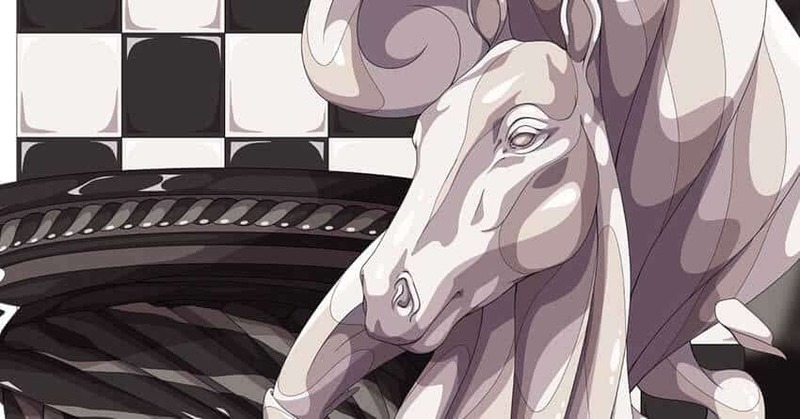 This was done by creating a grey colored layer on multiply layer mode. I did this to increase the point of interest to the center fish and making the other fishes less relevant. We now have the base rendering and the color scheme. Also, the line art is working and the image looks rather nice. This stage is meant for further refining. We shouldn’t settle for less. Thus I usually go through the shadows once again by activating the light color layer and rendering more. I usually also find things which need correction or should be drawn differently so don’t hesitate to fix those parts. When the rendering is complete and the colors are working and everything seems nice and all. It is time for final adjustments. This phase I usually complete in Adobe Photoshop because of the ease of use and the various adjustments it offers. I have thought of using Lightroom for this phase but for now, I am using Photoshop. I add Levels, Brightness & Contrast, Color Balance, Curves. It is useful to try different adjustments and which give you the best results. Sometimes Levels are not needed and all can be achieved with Curves tool. Color balance is something I usually add. The tool provides some excellent results for the image and kind of unites all the colors together. I also add noise layer and blur to the image a little. This is to get the image and different parts of it united and together. Lastly, I check the whole image through and see if everything is just the way I want them to be. If I see something that is off or something. I either correct it or accept that the image is not perfect.